Partly cloudy this evening, then becoming cloudy after midnight. Low around 55F. Winds SSW at 5 to 10 mph.. Partly cloudy this evening, then becoming cloudy after midnight. Low around 55F. Winds SSW at 5 to 10 mph. MORGANTON – A man found dead Saturday was identified as a suspect who led Burke and McDowell law enforcement on a chase last week. Douglas Allen Cox, 32, of 5034 Dysartsville Road in Morganton, was found dead from an apparent accidental drowning, according to a release from the Burke County Sheriff's Office. 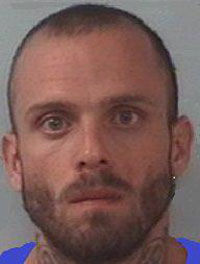 Cox was reported missing by his sister on Jan. 24, the release said. Cox's sister said no one had heard from him since Jan. 21. Investigators determined that Cox had been involved in a vehicle chase with the McDowell County Sheriff's Office that crossed into Burke County on Jan. 21, the release said. The chase ended on Powerhouse Road near Conley Bumgarner Road, where Cox jumped out of the car and ran toward the Catawba River. Police searched for Cox the day of the chase but were unable to find him, the release said. Following a search by Burke County Emergency Management with the Burke County Rescue Squad, local land owners and BCSO, Cox's body was found about 75 yards below where he was believed to have entered the river, the release said. Cox's body was examined by the medical examiner, who believed that Cox died from accidental drowning due to probable hypothermia based on the ambient outside temperature and water temperature, the release said. The McDowell County Sheriff's Office and North Carolina State Highway Patrol also assisted with the case, the release said. According to NC Department of Public Safety records, Cox had a significant number of criminal offenses in both McDowell and Burke Counties since 2012, with charges including shoplifting, felony breaking and entering, larceny, assault with a deadly weapon inflicting serious injury and child abuse; his total incarceration time was listed at five years, 10 months and 16 days.